Chemistry has never been this gross or fun! 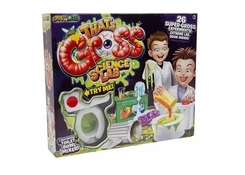 Featuring a motorized toilet bowl mixer with real flushing sounds and a gross-tastic lab book packed with 26 super gross experiments including Foaming Flush, Snot Slime, Potty Putty and Stink Bubbles - the gross-out fun will last for hours! Read all about it! Explore the disgusting side of science while learning about chemical reactions, polymers, diffusion, gas expansion and more! Includes Motorized toilet bowl mixer with flushing sounds, Garbage can shaker, 'Biohazard' graduated cylinder, 3 gross molds (barf, maggot, centipede), Bubble beakers with slime stand, Worm spoon, Bubble wand, Funnel, 24-page full-color book.